I have not much to tell about this LP; all I know is what said on the cover. 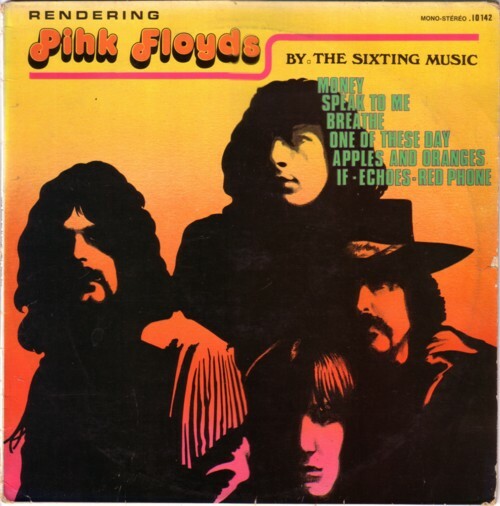 A band named The Sixting Music, which probably never existed apart from the few days that they were in a studio to record this LP. 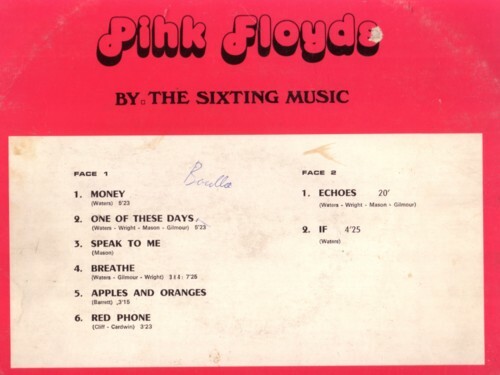 The Sixting Music does covers of eight Pink Floyd compositions, including the 20 minutes long ”Echoes” . You would have to search real hard to find a hit song that has not been covered for exploitational reasons. This LP is not unique. There are thousands of such LP’s. The cover tells it all: the main words are the name of the band that is being exploited and the picture is just as misleading. There are more and better techniques to mislead record buyers, but this LP is a classic example of an exploitaiton record. Since I collect these exploitation records, I know what to expect. But I am also hoping for a surprise. Well, one of the best surprises that I ever found in this genre is this LP by The Sixting Music! What an amazing job did these guys do. I would not be surprised if one day it turned out that one or two members of Pink Floyd had a hand in this LP. I know of at least one band who did this ( Batmobile ). I guess they did “apples and oranges” quite well too? Hey Frits, now that you used it in your blog, it’s time for this record to move on. To my collection for instance. Okay then, for all those CD’s that you are one day going to give me of all those amazing records that you unearth.